Since I’m in “I have a trailer, I can do all the things!” mode, when I saw that a semi-local farm was putting on the very first Indoor Eventing show I’ve ever seen offered in Texas, I knew I had to go. Never done anything like indoor eventing, but I was super curious about the concept so I figured it was worth checking out. Since I wasn’t really sure what the course would be like or how Henry would take to it, I played it safe and entered Novice. My ride times were super reasonable… 9:56 dressage and 11:40 stadium. We rolled out of Austin around 6:15 and into Tomball by 8:30 which gave us the perfect amount of time to check in, unload, scope everything out, find a bathroom, and slowly get ready for dressage. The warm-up was in a really small area so I opted to keep it short and sweet. Henry was actually very good – probably the best he’s ever given me in a short warm-up at a show. Sadly, he thought the dressage ring was terrifying. Luckily most of the other horses agreed. It was inside, with lots of stuff along the rail, and the judge was sitting in a big box above the horse’s eye level on the rail at C. Demons, obviously. He wasn’t belligerent about it, he just politely declined all my requests to get within 6′ of the rail by C and wasn’t nearly as relaxed as he was in warm-up. Oh, and I made an error for the first time ever in my dressage life. Oopsy. I realized it the second I did it and immediately got back on track, but there went 2 points. Apparently Novice test A is just too hard to remember. Total idiot. We had some good moments though, earning a few 8’s, and I can’t really be upset at him for being a bit spooky in a ring that almost every other horse agreed was certain death. Somehow we managed to be sitting in 2nd after dressage with a 34 (thanks judge for the charity! and thanks other horses for also being terrified!). Still annoyed at myself for giving away 2 points out of simple lack of focus on my part. After I untacked Henry we walked over to the jumping ring to check out the course. I wasn’t really sure what to expect but it was actually pretty neat. We had 16 jumping efforts total, jumping several fences both directions, and with a few tricky lines and turns. The jumps all looked really small though, so I figured it would be fine. The first two people that went in my division didn’t make it around. The course was definitely riding a bit spooky. The ring was kind of dark and there was a lot of stuff in there, and some of them just seemed a bit confused by it all. My plan was just to try to keep coming forward on a steady rhythm and let everything come to us, and see how he felt. Sometimes spooky courses work in my favor. And this was one of those times. For as spooky as he was about the monsters in the dressage ring, he didn’t bat an eye at anything in there, he was just a bit more careful. I got crooked and buried him at 4, and he totally locked on 1 while we were turning to 7 so that turn was a bit awkward, but in general I thought he was great. Totally game-on about everything and always looking for the next fence. And clear! He felt really happy jumping around, and handled it easily, so I hope it was a good confidence builder for him. Bonus – we held on to 2nd and got to take home a gift certificate. Indoor eventing = super fun! We will definitely be back! Henry is a rockstar. I love how much fun it looks like he was having. WHEE that looks like fun!! Congrats. and what a spooky spooky venue. Both the dressage and the jumping. Jeez. it looked tight too. glad you guys rocked it. ha i totally saw when he locked on the wrong jump HEE Henry so funny. It was 80 yesterday. Perfect. I’m most impressed you were able to remember 16 jumps in order!! I KNOW RIGHT??? An hour to remember a 16 jump course – no problem… literally almost A YEAR of that effing Novice A test and I’m all “I have no freaking idea”. After the free walk I tried to turn on the diagonal again instead of going straight to the half circle/canter. that looks REALLY fun… i’d love to do indoor eventing or some kind of derby class… don’t know too many of them around me but i think that’s more lack of looking than anything else. also i’ve had a baby way too long. those jumps look huge. gulp. I’ve heard a little about indoor eventing, but hadn’t ever watched any. You two looked great! 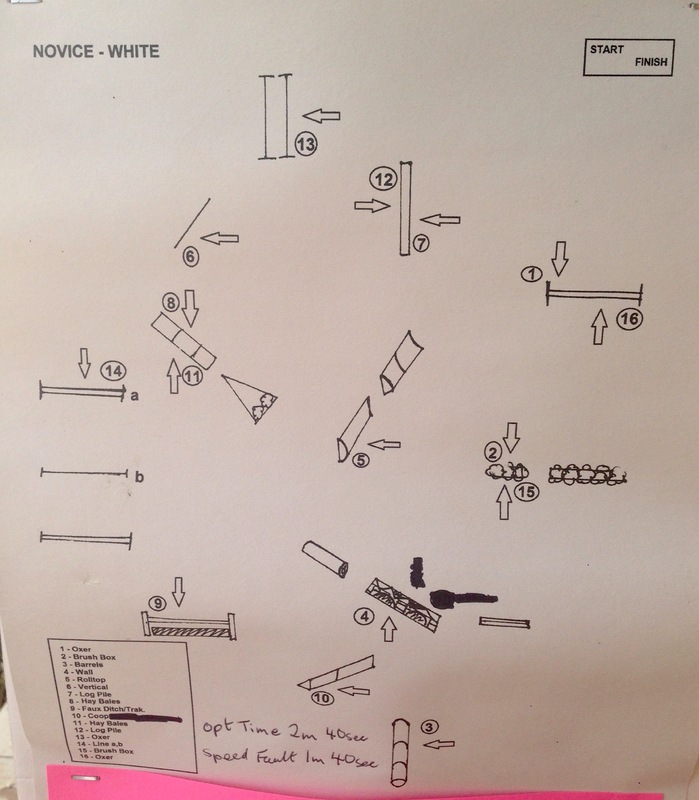 I rider hunter/jumpers so the thought of memorizing any sort of dressage test pretty much blows my mind. Congrats on the second! OMG That is so awesome! 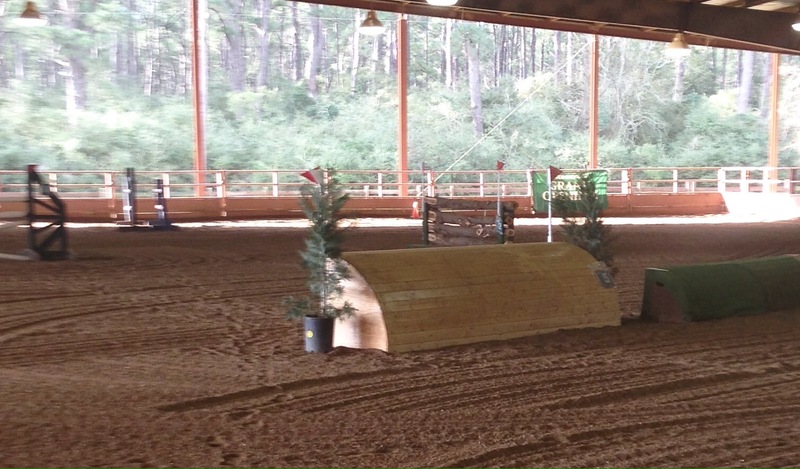 I had no idea there was Indoor Eventing in Texas and so close to Houston! You guys look fantastic, congrats! That’s a record I hope to never equal. I’ve always wanted to try indoor eventing! Wish someone would do one near me, looks like fun! This is awesome! He looked super happy and rideable through all those tricky lines. Definitely a good course. I especially love this since running the GHTCA feature on EN!! It was a GHCTA event! Such a great local circuit. It doesn’t help that Novice A is the longest test ever. But damn, that looks like sooo much fun! He made easy work of that course. That looks fun. I would totally go do one of those. Simon would be good at it! He’s pretty brave. That looks so fun! Well done. How cool is that?! I wish we had some indoor eventing round here for winter! Even some “spooky” better fill jumps, or logs, or something… You guys looked great! aaaaaaaand now i desperately want to do this haha. Henry looks great – nicely ridden!